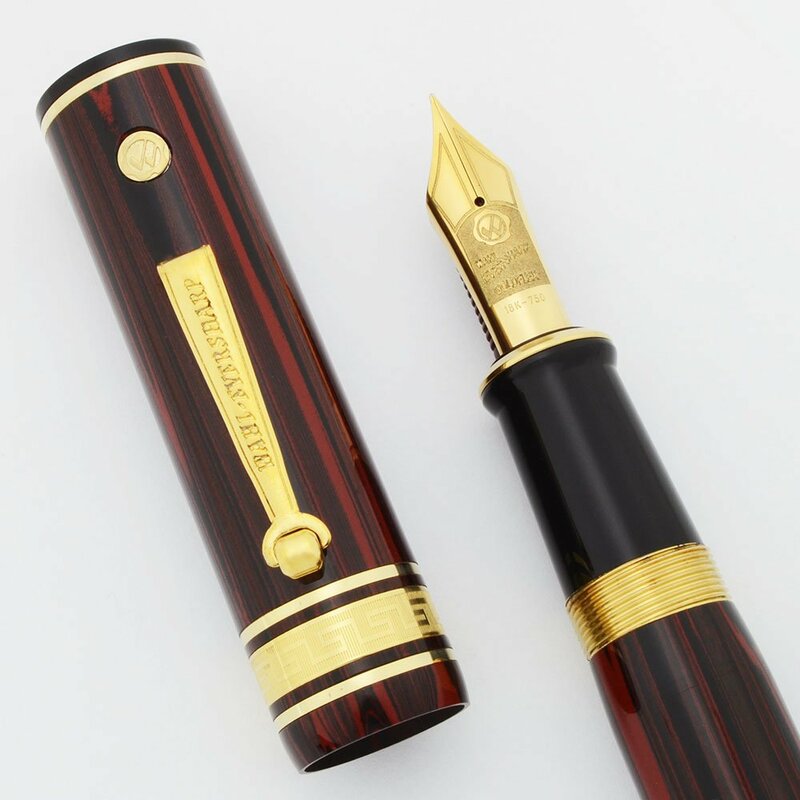 Modern Wahl-Eversharp Decoband fountain pen from the Decoband Gold Seal Oversized Collection. This is the Rosewood ebonite version with a pneumatic filling system. The pneumatic metal tube has a Greek key pattern on it that matches the cap band. 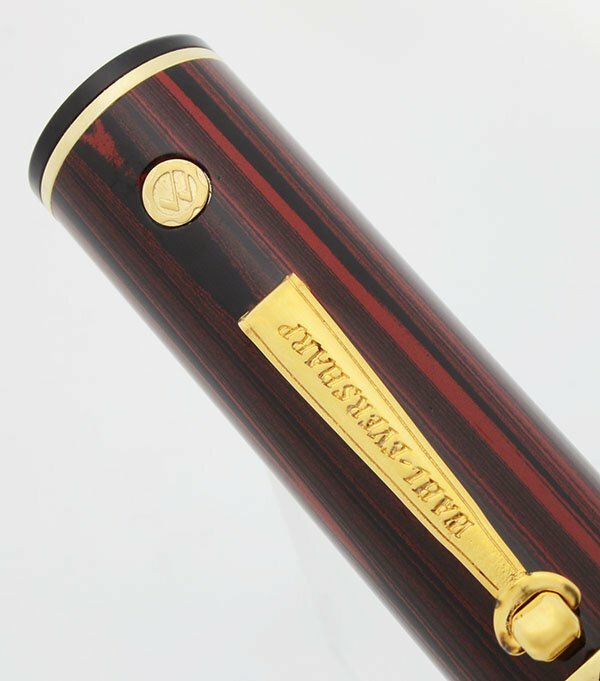 It has a red colored feed and the modern Wahl Eversharp "Goldflex" 18k nib which we consider a relatively flexible fine. The original packaging is present, including two different pen sleeves, a rubber grip for the pneumatic knob, full bottle of Everberry ink, large box, external box, and paperwork. Superior condition. Type Modern version of a fountain pen classic. Product Name Decoband Gold Seal Oversized. It has Product Code 2.0.7.8 according to the paperwork in the box. 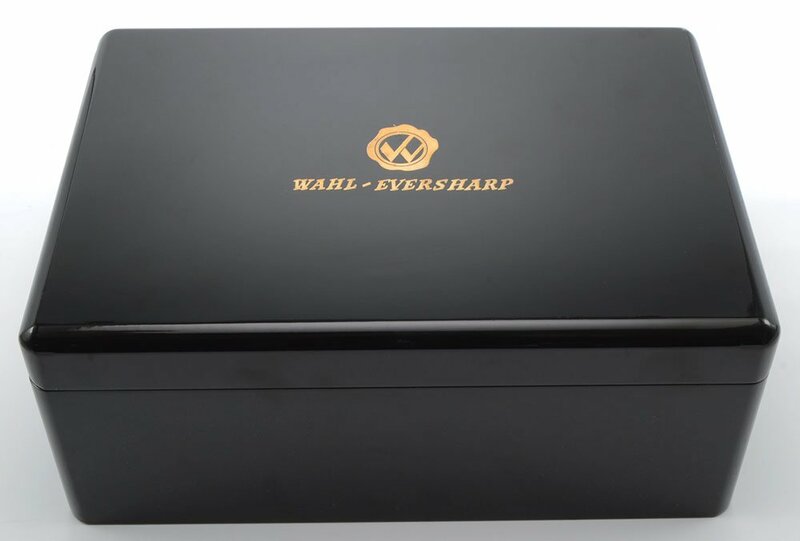 Manufacturer and Year Wahl-Eversharp (modern re-incarnation of company) -- 2015-2017, the paperwork is dated for purchase in 2017 and the model launched in 2015. Filling System Pneumatic filling system. Much like the pneumatic system used by Edison and the touchdown system used by Sheaffer, you unscrew the knob at the end of the barrel and pull out the tube before putting the pen in ink. Then push the knob in and re-tighten it. The pen boasts that it holds 2ml of ink at a time and this pen has been restored/serviced in house. It has been tested and is working well. 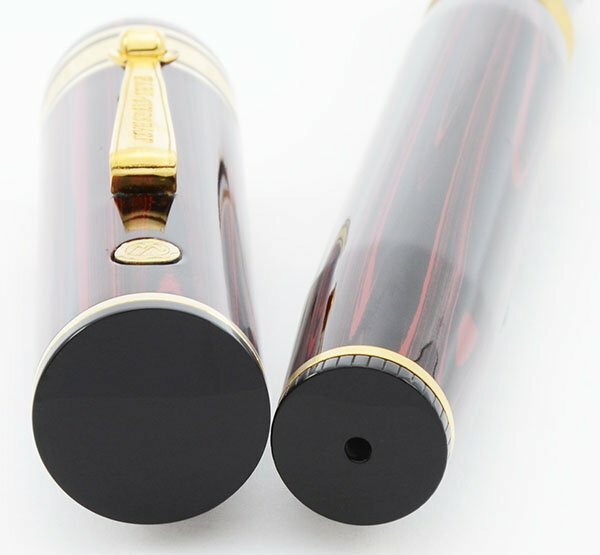 The pneumatic knob turns easily for this particular pen but it can be a little tricky to grab because it is not large. Color This is the Rosewood version. 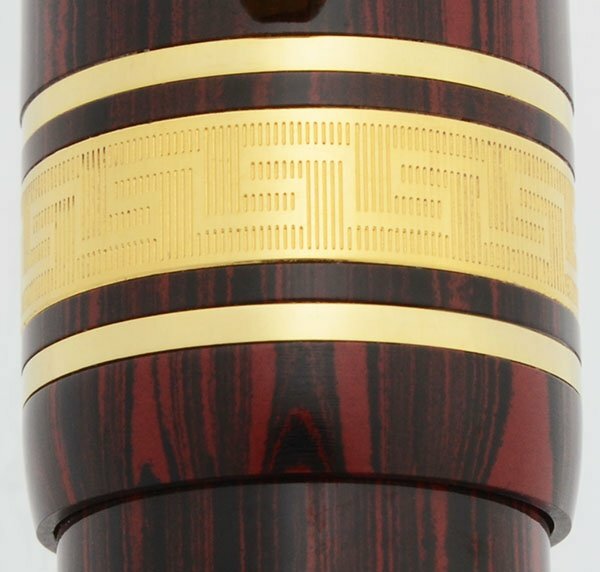 It has a red woodgrain pattern and is made of ebonite. The trim is gold plated with a jeweler's band of stacked coins beneath the section and a Greek key patterned band near the cap lip. There are matching Greek key patterns on the metal tube of the pneumatic filler. The section and end pieces are black. 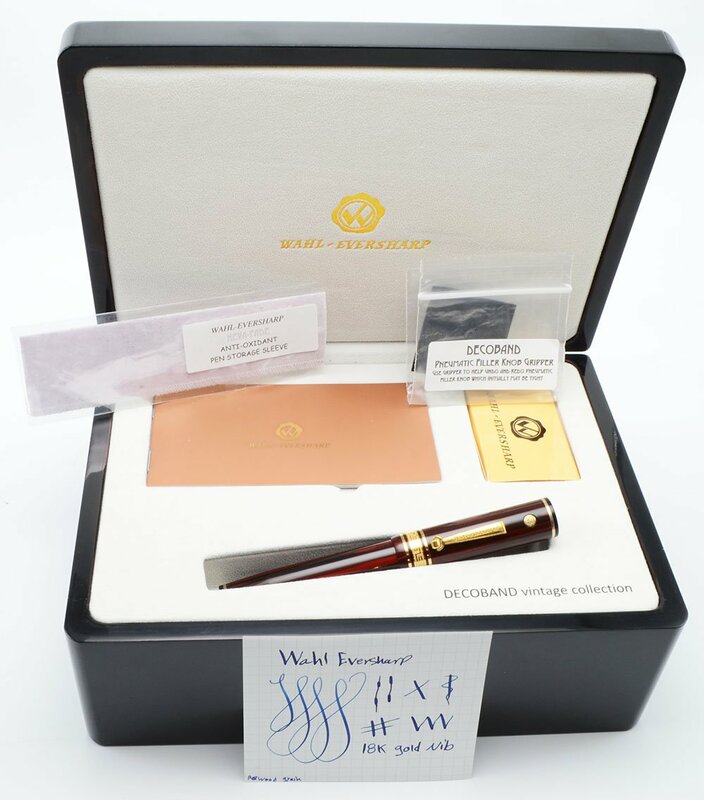 Nib FINE FLEXIBLE Wahl-Eversharp "Goldflex" 18k nib. It is smooth with large tipping material and nice spring for good line variation. It is very good flex for a modern nib. See the writing sample below. The "Goldflex" nib was meant to put down slightly finer lines than the "Superflex" nib. The feed is painted red and has a few pieces missing. 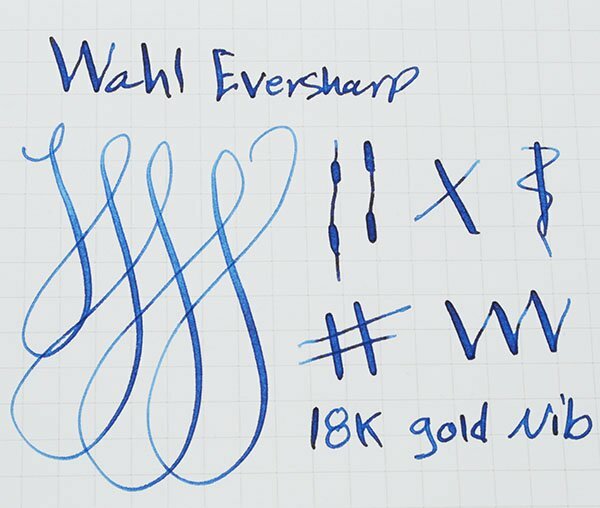 Please note: So far we've noticed three different flexible nibs produced by the modern Wahl-Eversharp: the 14k "Superflex" nib, the 18k "Goldflex" nib, and the 18k "Superflex" nib. We can only confirm that the 18k "Superflex" nib is currently produced. Condition Superior condition. The pen has some handwear that you can see based on the reflections. It's very shiny and smooth. There are a few places where the painted feed shows wear. The plating is great and the imprints are clear. Most of the original packaging is present. This pen ships with lots of accouterments. The original packaging includes a "Neva Fade" anti-oxidant pen storage sleeve, a cloth pen sleeve, piece of rubber to use as a grip for the pneumatic knob, paperwork including the product number, filling instructions, and a brief history of Wahl-Eversharp. An unused bottle of Wahl-Eversharp Everberry ink in vintage-style bottle is also included. Everberry is a light slightly purple royal blue. All of this is in a large black box. The white paper outer box is included. The only part of the packaging that we've noticed not to be present is the a small piece of padding that goes over the pen when it is boxed.